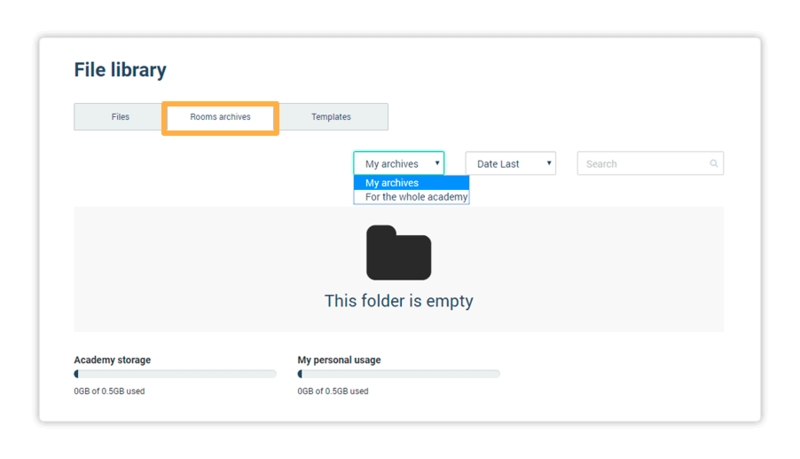 The File library menu allows you to create folders for better organisation of your files or simply upload them to the main directory. You can also select multiple files and drag and drop them at the window. Depending of the file size, the upload may take anywhere from a few seconds to a few minutes. In the bottom right corner of your screen you will see a bar. It shows you how much of your available space is currently in use. 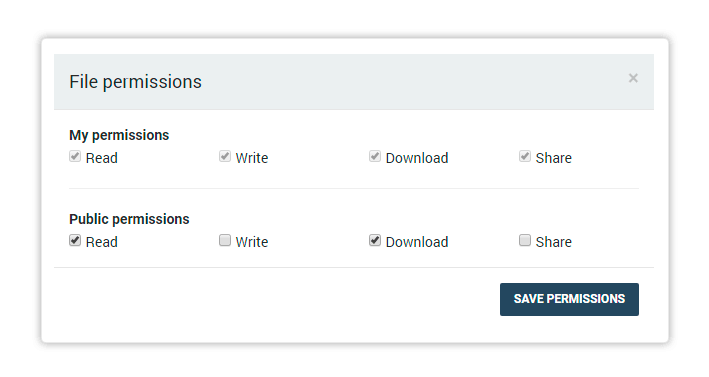 Once you upload, you have option to search, sort, move or delete one, multiple, or all files. You can download files previously uploaded. Furthermore, you can see additional options when you hover over the row where the file is located with your mouse cursor. The additional options are DELETE and SETTINGS. If you choose to delete files, a new window will prompt you to confirm the action. Deleted files cannot be retrieved from the library. Settings also have a pop-up window, where you can see your permissions, as well as public ones. You can change public permissions and see what your permissions for the file are. 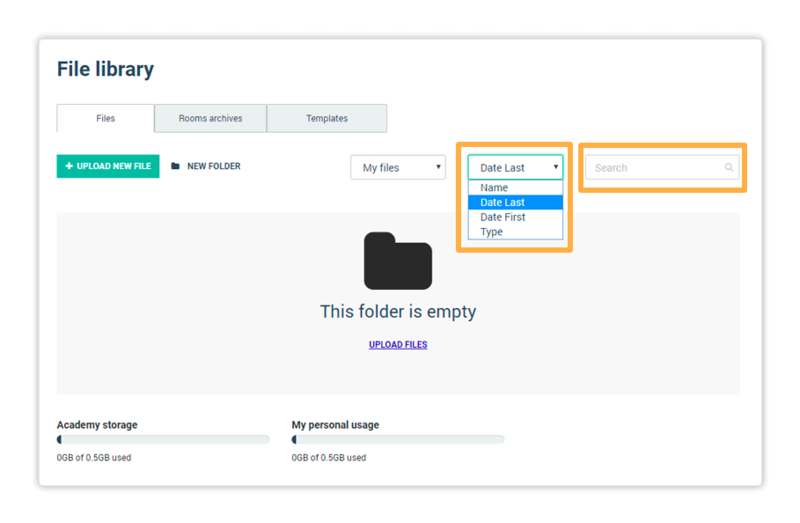 The upper drop down menu will you to sort your own files- My files and files that have been uploaded by your academy users – For the whole academy. 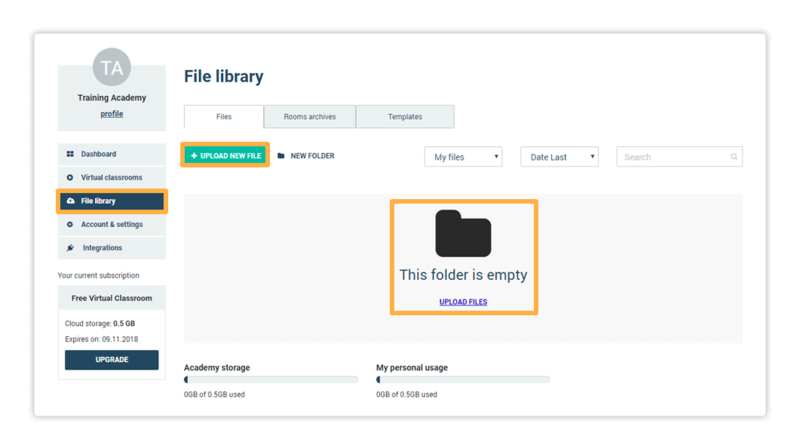 As an Administrator you have the option of managing all files that have been uploaded. The Rooms archives tab is where the recordings of the previous sessions are stored. You have the option of reviewing archives of rooms that you have created. The last tab is Templates, it is where all of the created templates on the academy are found. Have in mind that editing a template will create a room, specifically for that purpose, since any additional materials need to be uploaded via the virtual classroom and then saved as a template.